Surface mounted hinges such as butterfly hinges, or H-hinges mount on the surface of the cabinetry. The entire hinge shows and these require a frame around the doors. Mortise Hinges mount in a cutaway area on the edge of the door and the frame. The depth of the mortises plus the gap equals the diameter of the hinge barrel. Non-Mortise Hinges are surface mounted on the door edge and frame. The gap between the door and frame equals the thickness of the hinge leaf. 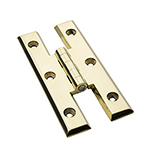 Rolled barrel hinges are made from flat sheets of brass. The shape is cut out and the barrel is rolled around a pin. This cabinet hinge type has knuckles that are machined to close tolerances. Extruded hinges are thicker and stronger than rolled-barrel hinges and are generally considered to be a step above even the finest rolled-barrel hinge. Forged hinges are made by squeezing metal billets in presses that make the metal flow like toothpaste. 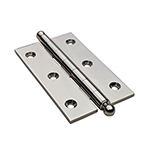 These hinges can have the detailing of cast hinges while being much more precise and stronger. Hand forged hinges, like our rat tail hinges, are made by our blacksmiths the old fashioned way; with a hammer, an anvil, and a coal forge. Each piece is handmade one at a time by heating the iron and shaping the pieces with a series of hammers, tangs, and anvils. Each is a work of art and no two pieces are exactly alike. The finish is an authentic 18th-century linseed oil finish with a heat blackened color.